Known as the Noble City, Mdini was the original capital of Malta before the arrival of the Knights of St John in the Middle Ages. Initially a Phoenician town, it underwent periods of Roman, Arbaic and Norman occupation. Situated on a rocky outcrop about nine miles (15km) west of Valletta, the elegant walled settlement can trace its origins back more than 4,000 years. Although today, all that remains is the largely restored medieval town. 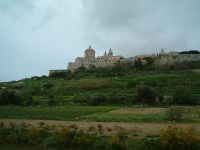 At the heart of Mdina is the landmark Baroque Cathedral of St Paul. While the Knights reigned over Malta the city became the home of the Maltese nobility, who lived there under autonomous rule and deemed unworthy of joining the Order of St John. Descendants of some of these families still live in the city. Mdina and the ancient suburb of Rabat not only offer some fascinating and valuable sightseeing opportunities, but also come alive in their own unique ways when the sun sets. Lamplight accompany ambient evenings spent in restaurants, tucked away in bastions and palace courtyards. Motor vehicles are banned inside the city walls, and pedestrians have free reign to walk the streets and take in this precious site of Maltese heritage.